Welcome back for a little fire breathing today as we finally give those that love a little smoke in their whisky their due. 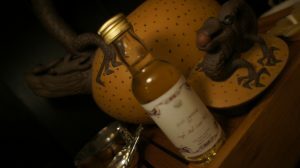 Sourced from the Tobermory distillery on the Isle of Mull today’s dram is labelled Ledaig by A.D. Rattray in deference to the brand used for their peated Single Malt. We always try to have at least one or two island distilleries represented throughout the 25 days of dramming and it is fantastic to finally have a heavily peated Island expression in front of us. 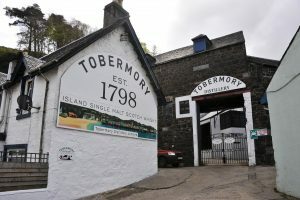 Tobermory is the only distillery on the isle of Mull and was founded in 1798. One of the oldest commercial distilleries in Scotland, Tobermory has a rich history. It was closed for 41 years from the mid 30’s till the 1970’s and then still struggled with uncertain markets and difficult economic times and in the 1980’s some of the distillery warehousing was converted into flats (townhouses) and it looked like another closure was inevitable. Burns Stewart purchased it in 1993 and breathed a new lease of life into the distillery. With a unique spirit that captures the heart of the Scottish Isles Tobermory is amongst only a few distilleries that boast two house styles. Today we get to try Ledaig (pronounced Le chig) as seen from the eyes of the excellent team at A.D. Rattray. Ledaig Single Malt 9 Year Old aged in a refill Bourbon cask and bottled at the cask strength of 57.9%. Colour: Light as you would expect from only 9 years in a refill cask boasting a lovely polished Pinot Gris effect. Nose: Buttered Popcorn on the cusp of being over popped. Topped with bacon bits and sea salt. Finish: Long salty, earthy, rubbery and all with a backbone of a smoky sweetness. This is a delicious Ledaig and I love the contrast here from what Islay brings to the table in terms of peated whisky. This is every bit as large and consuming but definitely has a much different feel. Younger peated whisky is something I find myself reaching for when I want some big smoke and peat flavors that are underpinned by youthful fruit. This Island variant fits the bill perfectly and absolutely warms all the way down. Even now I can still feel it’s magic all over my tongue and throat. Certainly the cask strength here just absolutely gives it wings. Water: Just a couple of drops here adds even more sweetness and just takes that living large edge away. Some marzipan kicks in at the death stealing the limelight. I think for most occassions I would go big or go home on this one personally but I did really like the slightly softer and sweeter version that mutated with a little water. Tomorrow we head to the Highlands to welcome a brand new independent bottler to the calendar. On this day in the 2nd edition we had the delicious A.D. Rattray Caol Ila I didn’t actually mean for this to be so spot on with the order from the 2nd edition but I do know that keeping the peat lovers away from their favorite flavors for too long is a dangerous thing so there will always be something to sooth the aching need at least once a week. For those looking for this delicious Ledaig alas there was none to be had after we took our stash for the 3rd edition. Whatever you have in your glass or still in your bottle is all there is. Johanne has her take on this A.D. Rattray Ledaig here. Wow! What a unique flavour. Truth be told – I was not a fan right out of the bottle. But with some ice and just a touch of water this amazing sweet and salty flavour came out that lit my fire. Loved it. Before the water the finish was just a touch too much. It was a strong one I agree. I have trouble going back to regular strength when the Calendar is done! Spoiled I guess. Peat is for sure the first thing that I get on the nose- and I am glad for that! At the same time I get a slightly citrus and creamy note (if that can actually happen at the same time). Maybe butter milk after a prompt from Jonathan? I am always interested in how the peat can be so bold and still give way to other nuances. On the palate I get a sweet burnt marshmallow wrapped in a reasonably thick peat blanket. Maybe burnt BBQ sauce. A spicy long and lingering finish allows for long pauses between sips which make this a slow very enjoyable dram for me. Evening Johnathon. I am enjoying immensely my 3rd time around with the Calendar. 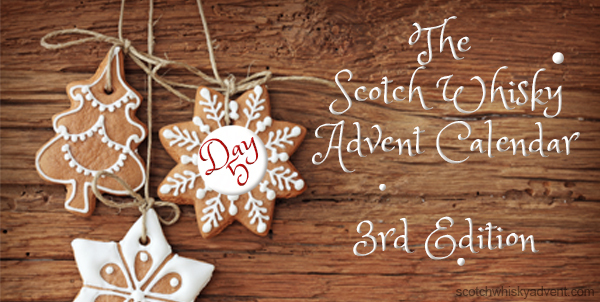 I find I am learning much about the world of single malts through your great Christmas gift to whisky lovers. I do not remember if I had this problem with the 1st and 2nd edition. But I am guessing though that I am not unique among your elderly customers. No worries Duncan your concerns are duly noted and our whisky elves will be working overtime to increase the font sizes on all bottles for the 4th edition. Not sure what happened there but chalk it down to the vagaries of working with multiple printing companies.